The Second Day at.. Rajasthan Fashion Week was as good as Day 1..
Its Always good to meet new, interesting people from different walks of life.. sharing the same interests and passions.. This was one such event.. Had people not only form all over India.. But from Around the world.. In short..it was an Enriching Experience.. The shots are taken by Mr. Vinod Kumar..( Official Photographer : VOGUE INDIA ) .. It was a Windy Day.. and you can see that in the pictures.. !! The whole feeling was so BOLLYWOOD :p with hair and clothes flowing with the Wind.. !! I am actually trying to Hold my Tank Top in the picture below.. The wind was so strong that I was afraid it would blow the Top Up!! But I love how the pictures have come.. :p #SelfObsessedMuch Hahahah!! Day 2 Outfit was more Comfy and Casual.. I chose this Fuchsia Pink , Asymmetrical Tank Top and Blue denim Jeggings.. !! The Last Outfit Post from The Fashion Week would be up soon..After which.. I am going to some Product reviews..So a lot of New Brands and Products coming your way..
Do let Me know how you like this Post..!! 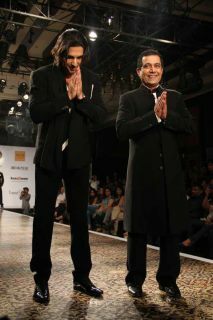 I LOVE reading your Comments and Suggestions..
After the last Fashion Week.. I realized attending them is one Fashionable Affair.. You just not have to LOOK Your BEST but also FEEL Comfortable in what you are wearing.. Because you are Not Some Model who just have to walk the Runway and then get outta that dress.. You have to sport it for the rest of the Day..(Unless you are a Celebrity or some exception..) So wear something that's..
2. Make a Statement - Because its Fashion Week.. you can't just wear your favorite Tee or Jegging ( in my case) .. You sure don't want to feel like some Alien among all the best dressed people..In short.. you should look you Stylish Best..
3. Keep it SIMPLE and YOU-- For example- If you are not a Dress person( like Me) you should NOT wear it just for the Sake of Fashion Week (or some other Fashion Event). The Outfit that you wear and how you accessorize the whole Look should be just YOU.. Its Not the RIGHT Day for Going over the top and Dressing like someone else.. So No Major Experiments..They might turn out into BLUNDERS ..!! 4. Others- I am a Big BAG person.. because I carry whole lot of stuff.. You dont have to do that..!! That's what I learnd .. Carry the few essentials.. and keep it as light, as possible.. coz you have to carry that for the rest of the Day..So I carried my Favorite Orange Side Sling Bag.. FOOTWEAR is an essential part of the look.. so if you are not feeling comfortable wearing it .. It will ruin the rest of you Day.. Its not the Day to deal with shoe bite rite?? Because Fashion Week requires a lot of walking and running around.. So I wore my favorite Tan Wedges.. Here are few pics from The Day.. I managed to Convince VOGUE India's Photographer, Mr. Vinod Kumar to click mypics everyday.. for Blog Posts..!! you can write your Suggestions and Feedback in the Comment Box below .. I LOVE Reading them..
Last few weeks have been hectic and busy.. so much that I didn't even post a single outfit post on the Blog. Have so many outfit post pictures waiting in the USB.. But I am still figuring out the way the be regular on my Blogging and College assignments.. With First year Of my M.Sc. In Fashion and Technology ending soon , I have a gazillion submission deadlines and a College Fashion Show(which is by the way, delayed by a month..!! disappointing much.. I know !!..) . Bracelets : Forever21, Flea Market.. 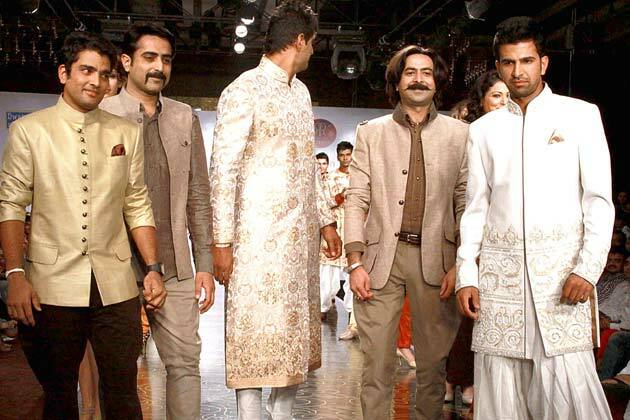 If you think Day 1 and Day 2 of Rajasthan Fashion week were MAGICAL then.. wait till you see what Day 3 has got in store for you..From Bollywood stars , Reality TV stars to Bollywood's own Favorite designers.. all under one roof..
Akshay Kumar and Sonakshi Sinah.. walked the ramp in Rowdy Collection. 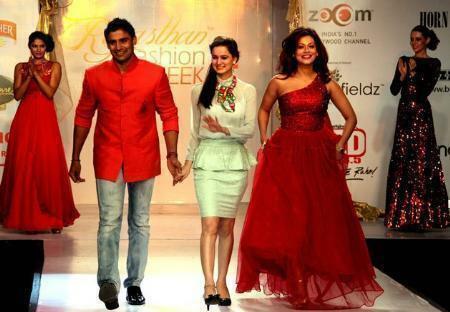 They were in the city to promote their recent release "Rowdy Rathore.."
Sangram Singh and Payal Rohatgi walked the ramp For Nitya Bajaj Birla ..Dressed like " Little Red Ridding Hood " in a Beautiful Red Gown..
Rohit Verma turned Show stopper again on Day 3 for Sulakshana Monga, Jesse Randhawa walked along them.. The Beautiful Event came to an end.. with a perfect Finale.. by Vikram Phadnis.., Rima Sen walked the ramp for him in this beautiful Lehanga.. There is so much more about these three days than just the Fashion Shows, Clothes , Designers or Celebs..Going to share all that in the upcoming posts.. The Day 2 at Rajsthan Fashion Week was Colorful..
Rohit Verma was the showstopper for her opening show on the second day of Rajasthan Fashion Week. · This young designer fromVarodra showcased an Indo-western collection with big motifs and a wide range of outfits ranging from semi stitched dresses, tunics , kurta, sarees ,chaniya-choli to bridal wear..and Swati Modo was the official shoe partner for the entire Fashion Week.. Among all the well know designers..there were few new names.. Hetal is one of them.. She is still a Fashion Design student in Kota, Rajasthan..
She is already making a mark in the Fashion industry with her entry in the prestigious, Rajasthan Fashion Week .. Her Collection was called, "Power of Shiva" so a lot of Rudraksha jewellery was seen and colors were earthy and eye-soothing ..
· Designer Surbhi Shah had supermodel Jesse Randhawa stopping the show for her. The look Surbhi gave to Jesse was a very ethnic inspired by the royal Rajasthan. She was draped in a bright Rajasthani colourful Gota Patti lehenga. 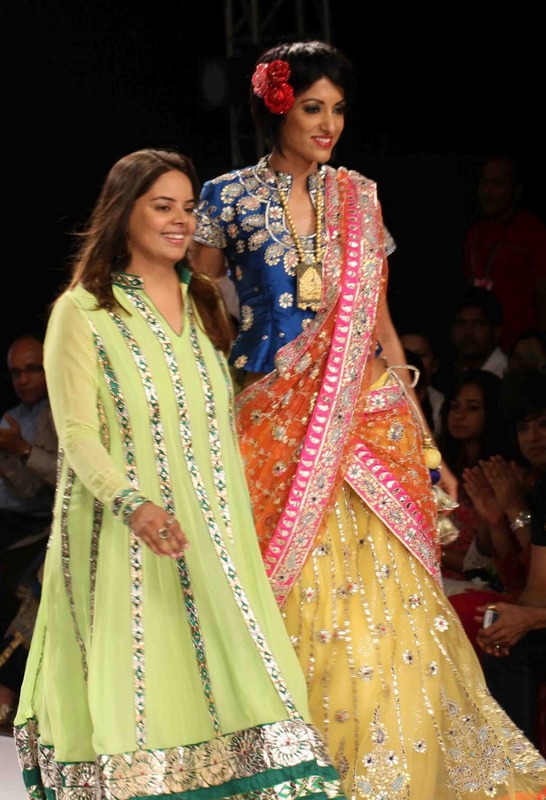 Surbhi Shah’s collection was a mixture of intricate Gotapatti work in an effort to revive the colourful Rajasthan. The word for the whole collection was "Beaututiful".. 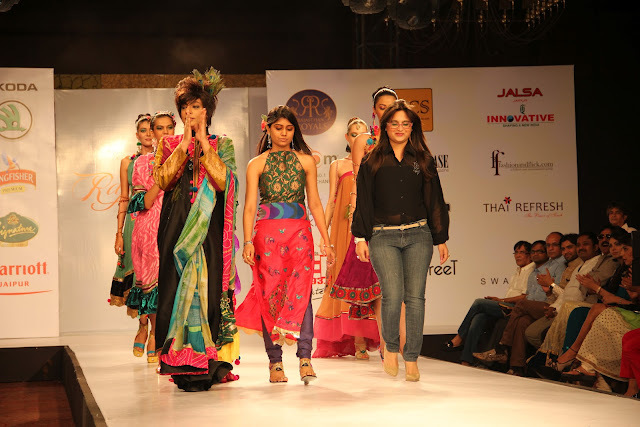 Ace Designer Pam Mehta showcased a ‘Floral Fiesta’, a collection wherein ‘Relaxed Couture comes to life. 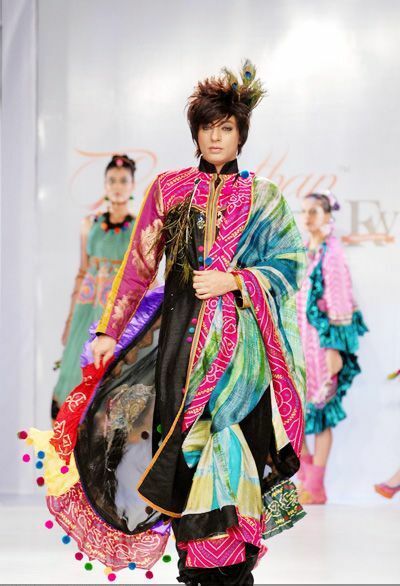 The collection was a amazingly vibrant, colourful embellishied with zari, resham and swarvoski. 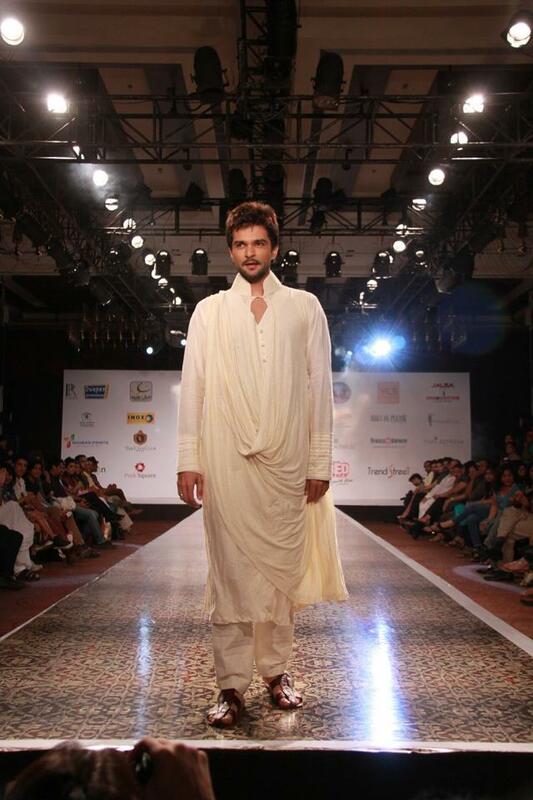 with predraped saris and sari gowns,it was a very unique concept in itself. The highlights of the collection were interesting head gears.. 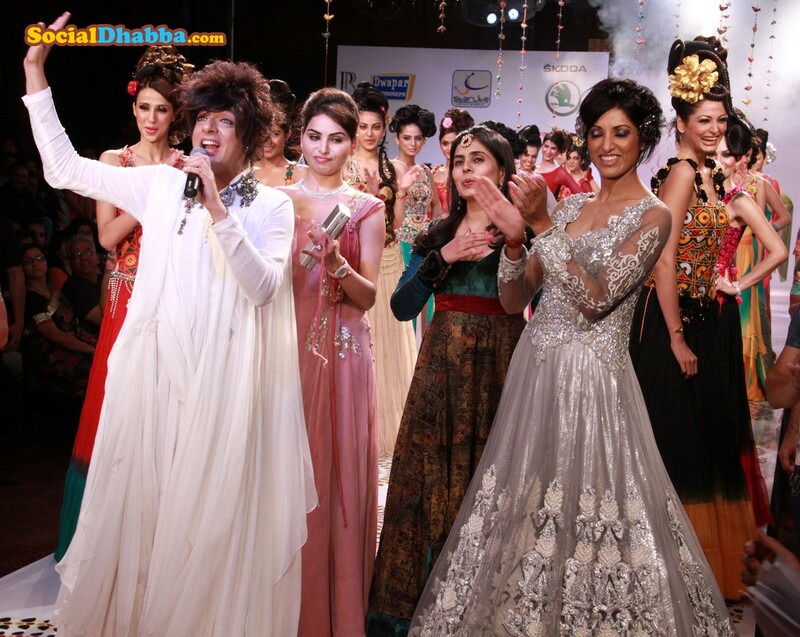 The gorgeous Riya Sen was her showstopper for the designer. Pam draped Riya in a eight kali pre-stiched lehenga sari in turquoise and gold. She wanted to potray Riya as a contemporary bride.. and sure.. She looked like one..
Sumit Dasgupta's collection was inspired by Chandragupta which potrayed the ancient Maurya’s Era. 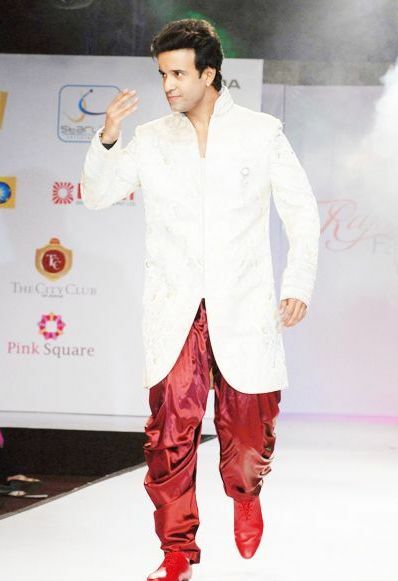 Television's popular face.. Aamir Ali walked the ramp for him..to open the show..He came and left in a hush-hush and was unavailable for media byte..
That's it for Day 2 of Rajasthan Fashion Week..If you this this was good.. you have better in store from Day 3 with a lot of Bollytown walking the Ramp..Stay tuned..
# How you can recycle your Mom's Closet.. When we were given #Tangerine as a theme for _InFB for remix I had no clue what to wear.. I went through my Closet but.. couldn't find anything that's apt for the theme.. Until yesterday.. when I realized that I have this"Salwar Suit " from my Cousin's wedding .. I wore this outfit on her Engagement(which was in April'12).. with Statement earrings and my all time favorite "Aldo gold watch.."
My Darling Mommie! 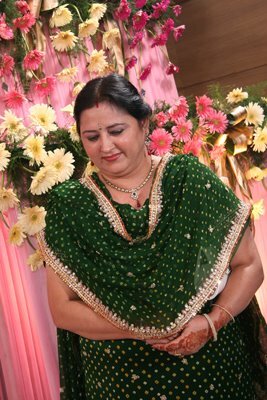 She wore Same Salwar Suit to another Cousin's Engagement a year before .. Since..My Mom got this suit.. I wanted to steal it.. so.. when recently I was suppose to shop for my cousin's wedding I saved instead.. I asked my friend Mansi Batra , who is a fellow design student and Boutique "Myra"..to do the suit for me that matches with the Dupatta and Salwar.. So we both sat down and did the whole design and chose Slik as fabric in Orange Color with Kundan work detailing on the sleeves and hemline.. I love experimenting with my Mom's Indian wear and My Dad's old shirts and Pants..
You can check some of my previous posts for ideas here..
* High Wait Pants--Pull it up..crop or fold it down..